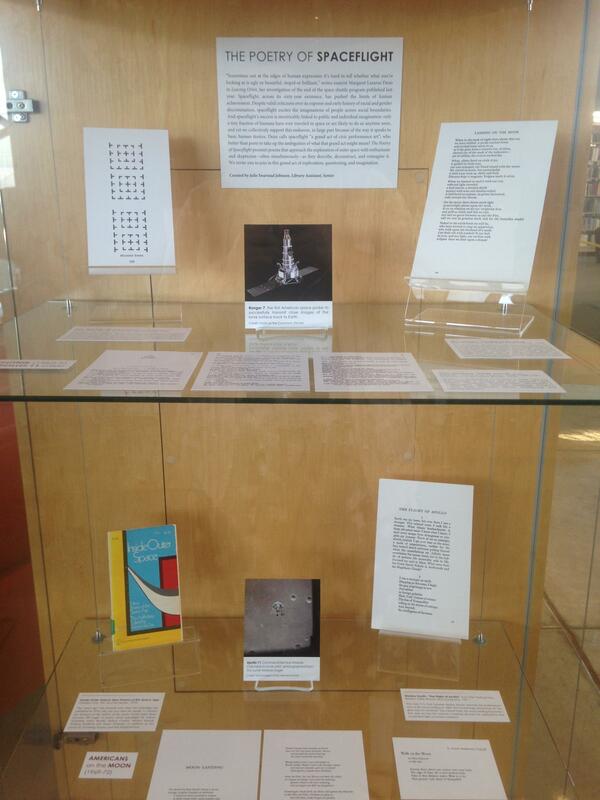 This article was written as an introduction to our fall library exhibit¸ The Poetry of Spaceflight. The exhibit is on display at the Poetry Center from August 15 through November 19 during the Poetry Center’s regular hours. Spaceflight—the exploration of outer space, by spacecraft with or without humans on board—depends on the imagination for its existence. It’s not just the usual relationship between idea and invention: spaceflight and space programs wouldn’t exist if entire nations didn’t believe in them. “The debate over whether it’s important for humans to go to space is a debate about the dream lives of taxpayers,” writes essayist Margaret Lazarus Dean in Leaving Orbit: Notes from the Last Days of American Spaceflight. Are we willing, collectively, to pay for a handful of people to go into space? Yes, it seems. This is something we want very badly. Our wanting manifests itself in the lasting appeal of sci-fi movies and novels, of Star Trek and Star Wars and Battlestar Galactica, of Klingons and Vulcans at Comic-Con, of Space Camp and the generations of little kids who want to be astronauts—even for all the ups and downs of the real space program. What do poets have to say about all of this? Last fall, I realized I could name a handful of poems or books that dealt with the Voyager space probes, launched by NASA in the 1970s to study Jupiter and Saturn, and that became the first manmade objects to leave our solar system in 2012: Heather Christle’s Heliopause, Srikanth Reddy’s Voyager, and David Wojahn’s “Blind Willie Johnson.” I began a scavenger hunt through the Poetry Center’s catalog to see if any other poets wrote about space exploration. The answer was an emphatic yes. Even before Sputnik 1 became the first manmade object to orbit the earth in 1957 and as Neil Armstrong and Buzz Aldrin stepped onto the moon in 1969, poets including W.H. Auden, Allen Ginsberg, and N. Scott Momaday wrote about what it might mean for humans to go to space. And an incredible array of poets are still writing about it today: Tracy K. Smith, Ben Lerner, Adrian Matejka, Brian Turner, Patricia Smith, and many more. 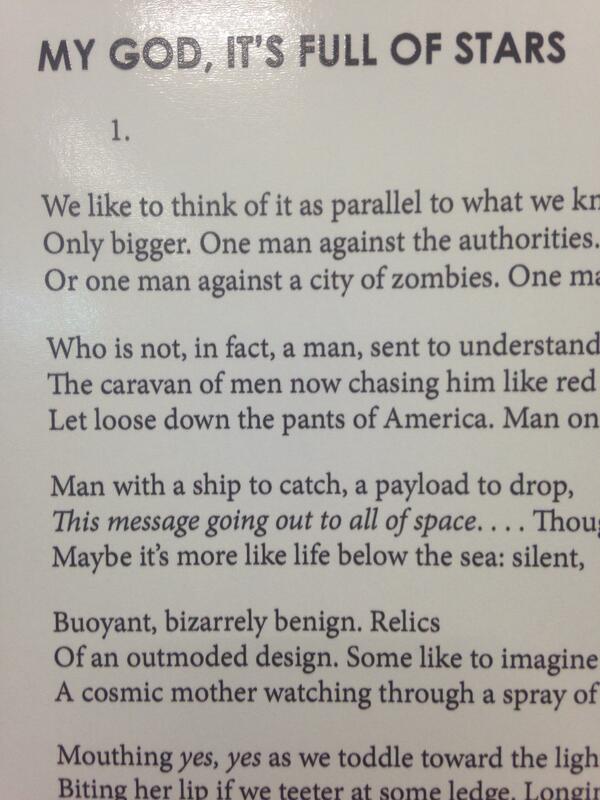 Poets, it would seem, have quite a lot to say about outer space. Surprise after surprise has met me as I did research for this exhibit. That US Poet Laureate wrote about the moon landing? That hallmark poet talked about her “space poems, or cosmic poems,” “my little science poems” when she read at the Poetry Center in 1974? 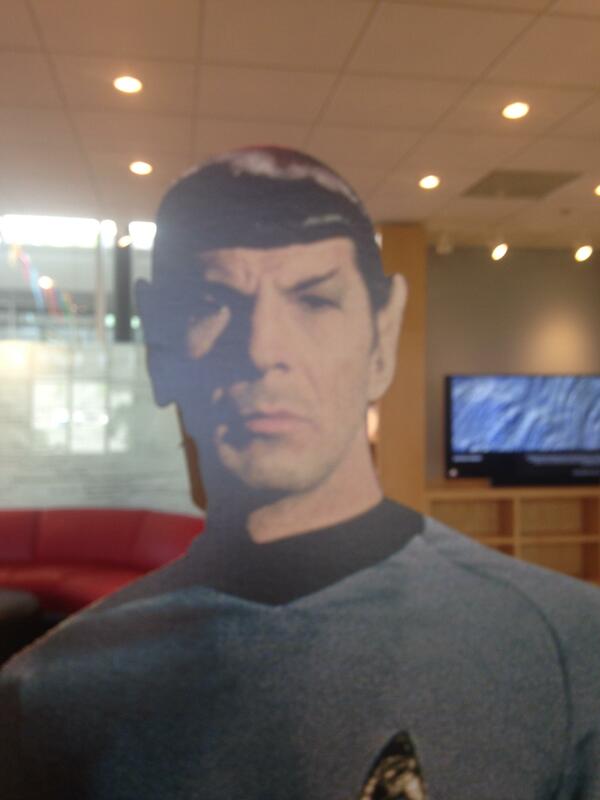 That Pulitzer Prize winner has obviously spent some time watching Star Trek: The Next Generation? 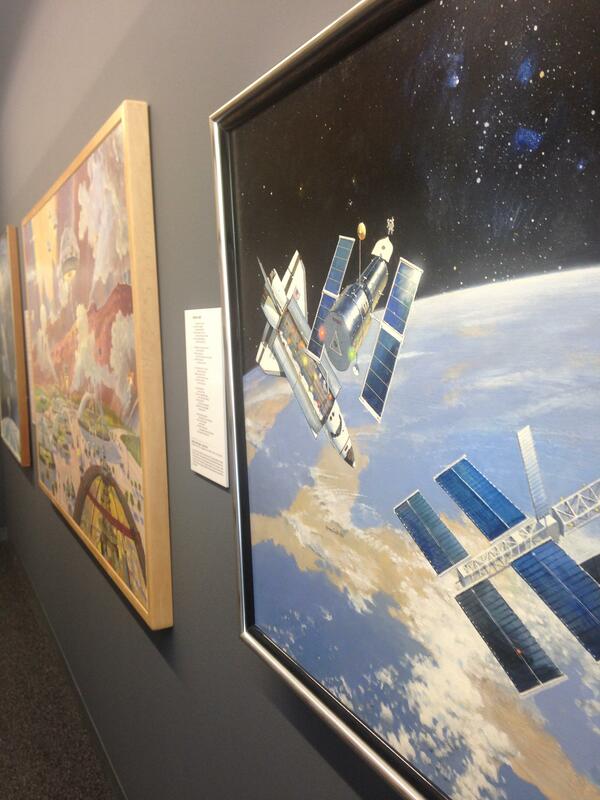 It’s also presented an opportunity to bring a piece of my sci-fi-reading childhood to the Poetry Center: the space art of Robert McCall, which you might have seen if you’ve visited the National Air and Space Museum in Washington DC. An enormous mural by McCall looks over the main lobby of the Glendale (AZ) Public Library, and I passed under its bare-limbed astronauts with glowing jet packs on my weekly sojourn to the sci-fi section as a kid. I learned last fall that McCall’s extensive collection of notebooks, sketches, and many finished works are held by the University of Arizona Archive of Visual Arts, and with the generous help of Jill McCleary, Archivist, a selection of McCall’s paintings appear alongside the exhibit in the Poetry Center library. McCall’s vision of spaceflight is a triumphant, idyllic, idealized one; it’s a pleasure to present his work alongside poems that complicate and deepen those striking images. About 550 people have ever traveled to outer space. Twelve have walked on the moon. Only six are in space right now (you can enjoy knowing how many people are up there right now with this handy app). Very, very few of us will ever go into space. But the idea that any human or even any object made by human hands might travel so far beyond us remains powerful, a feast for the imagination and a rich subject for poets, those masters of mingled delight and ambiguity. 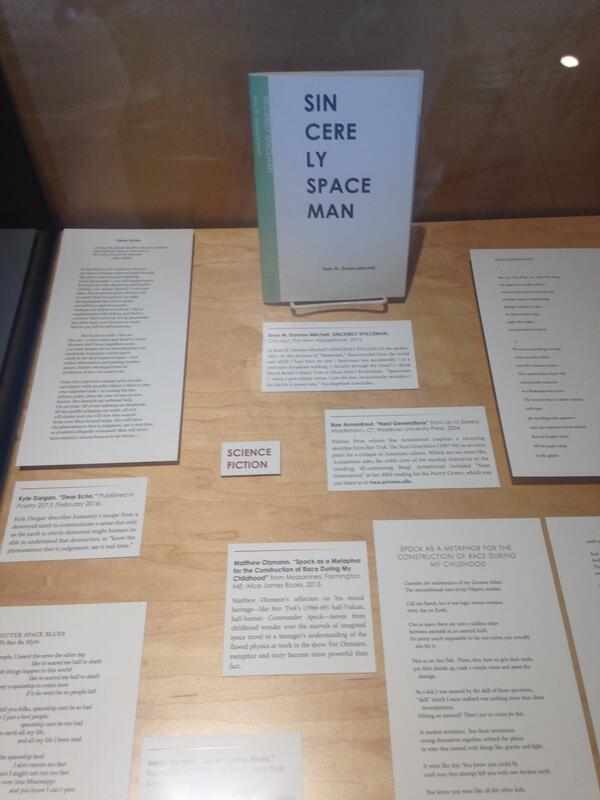 Pull out that old backpack with a NASA mission patch on it, put on your Star Fleet uniform (like Italian astronaut Samantha Cristoforetti), and join us in the Poetry Center library for a wild, surprising, inspiring look at the poetry of spaceflight. Stanley Kunitz, “The Flight of Apollo.” The Testing-Tree. Boston: Little, Brown and Company, 1971. Rae Armantrout, “Next Generations.” Up to Speed. Middletown, CT: Wesleyan University Press, 2004. Julie Swarstad Johnson is the Poetry Center’s Library Assistant, Senior. She is the author of a poetry chapbook, Jumping the Pit, and she regularly contributes book reviews to Harvard Review Online.